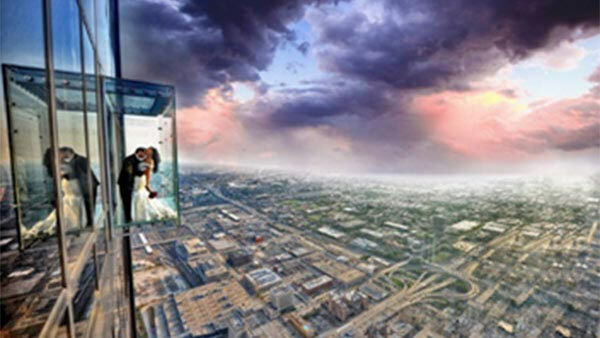 Four lucky couples will win a Valentine's Day wedding ceremony on the Willis Tower Skydeck. CHICAGO (WLS) -- Four couples will get married this month at the Skydeck of the Willis Tower as part of the second annual "Love on the Edge" contest ahead of Valentine's Day. The couples will get married Feb. 12. The couples will exchange vows from the ledge's glass-floor balconies that extend 4.3 feet from the building structure. The Skydeck is the highest observation deck in the U.S., located on the Willis Tower's 103rd floor at 1,353 feet in the sky. To date, there have been 874 known marriage proposals, 90 weddings, 15 vow renewals on the ledge. Winners will exchange their vows with eight guests in a private, 15-minute ceremony. After the ceremony, the newlyweds will celebrate with a champagne toast and receive their wedding gifts from Crate & Barrel and each couple will receive a complementary photo taken by Willis Tower's in-house photographer. For more information, visit https://www.facebook.com/Skydeckchicago/.